For the first time, Citroën will grace the 18th fairway as a featured marque at the 2018 Pebble Beach Concours d’Elegance, scheduled for Sunday, August 26th in Pebble Beach, California. 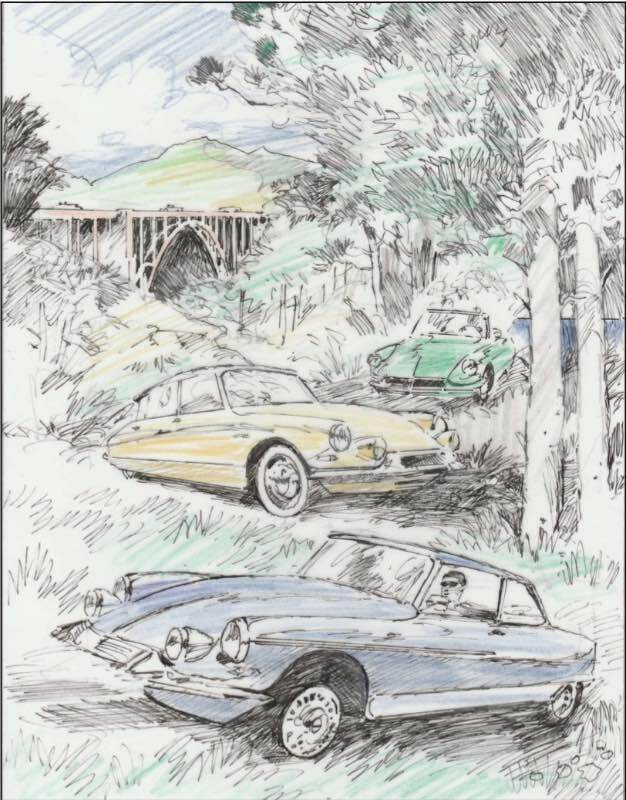 The Pebble Beach Tour d’Elegance poster, painted by Barry Rowe, commemorates this moment. Citroën enthusiast Jeffrey Fisher likens Citroëns to couturier dresses — “because they featured some of the highest number of interior and exterior permutations for a car ever.” The Tour poster features three cars from Fisher’s collection that illustrate the progression of the Citroën DS from middle class family car to postwar work of art. The 2018 Pebble Beach Tour poster marks Barry Rowe’s 20th anniversary as an artist for the Concours. At the forefront of the poster is the two-tone blue 1966 Citroën DS 21 Chapron Le Léman Coupé, one of roughly 24 produced. This very car (chassis 4350020) graced the stage at the 1966 Geneva Motor Show and represents the pinnacle of Citroën custom coachwork. The green 1967 DS 21 Chapron Cabriolet d’Usine was transformed to convertible specification straight from the factory while the Yellow DS 19 exemplifies the essence of the original DS saloon. All three of these Citroëns have been fully restored by renowned Citroën expert Vincent Crescia, who currently operates out of the very building that housed his father’s Citroën dealership.